Click on the square below to go strait to the financial support page. Since keeping The Syrian Petition going is too time-consuming as that we could continue on a voluntary basis, we need to professionalize. 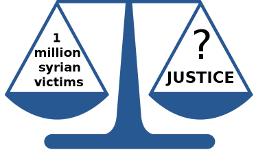 Only this way we stand a chance to build up a movement that will enable us to make the petition a success and to sue those directly or indirectly responsible for the genocidal massacre in Syria. At this stage we are at the Start-Up stage of our movement ! The minimal budget that we have to collect in order to assure a beginning professionalization is 95.000 €/$ . These are peanuts compared to the budgets of millions of dollars/euro the big NGO’s are working with. That budget will enable us to engage for 1 year 1 to 1.5 persons, who can dedicate their full time to the expansion of the movement. Part of the Start Up stage will also be the move from a non-for-profit unincorporated association to a non-for-profit incorporated association. We foresee that this struggle might last between 3 and 5 years. The financial needs will change through time depending on the growth of the organization and the legal actions taken. So please check our website from time to time or subscribe to it, so you will be informed automatically. What will happen to the left-over funds, once the organization stops to exist ? Though we do not know exactly if and how we will be able to organize it, but we are considering to let the supporters decide on which project the left-over money will be spent. We will try to make 5 propositions. And the money will be divided proportionally among the projects : a project that will get 10 % of the votes will get 10 % of the money.